This dresser is hand made in our own UK workshops. 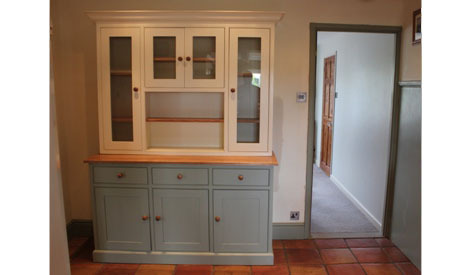 The one illustrated has a painted base finished in Farrow & Ball "Linchen Green" and painted rack finished in Farrow & Ball "Hardwick White" and an oak, non-disressed dresser base top in a Natural Oak Finish. When you are ready to place your order, please Contact us and confirm your choice of timber for the top, your choice of polished finish for the top, whether you require the top to be distressed or not, and your choice of paint for the base. The table below shows our retail prices in GBP and do not include VAT or shipping/delivery. Discounts apply for Trade Buyers - Contact us to request our Trade Price List, let us know if you are a stocking or non-stocking dealer and also provide us with your full business name and address.